Regardless of the materials your organization collects for recycling or reuse, the recipe for a successful program is always the same. These key steps are outlined in the CleanRiver 3C Process. Here’s an example of two very different types of organization who are collecting quite unique items for reuse. 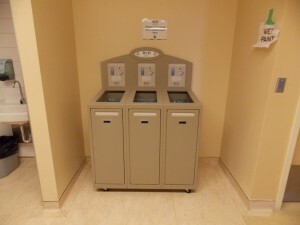 Even though one is a manufacturer and the other is a healthcare provider, they have both implemented the same best practices to make sure they meet their recycling goals. 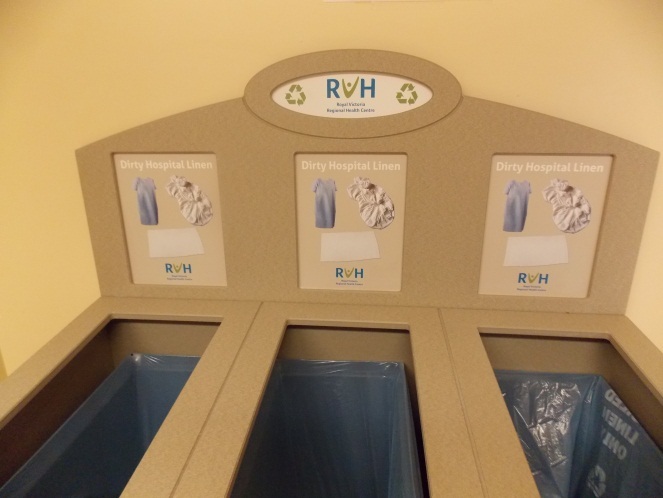 Royal Victoria Hospital (RVH) in Ontario needed an effective way to collect their patients’ used bed linens and sleepwear to be laundered before reuse. They were having success with CleanRiver recycling units in their waste management program and so enquired whether the product could be customized to this unique application. Challenge: The previous collection system was a metal x-frame bin with clear bags which meant the soiled items were visible to other patients, staff and visitors on the ward. Other garbage and items were also being tossed into the bins which resulted in additional resource time and costs to sort the linens before laundering. Richemont a European premium jewellery manufacturer produces extremely valuable scrap materials during the manufacturing process. Challenge: To effectively recycle the precious metals and gems, the materials need to be collected separately, to avoid contamination. 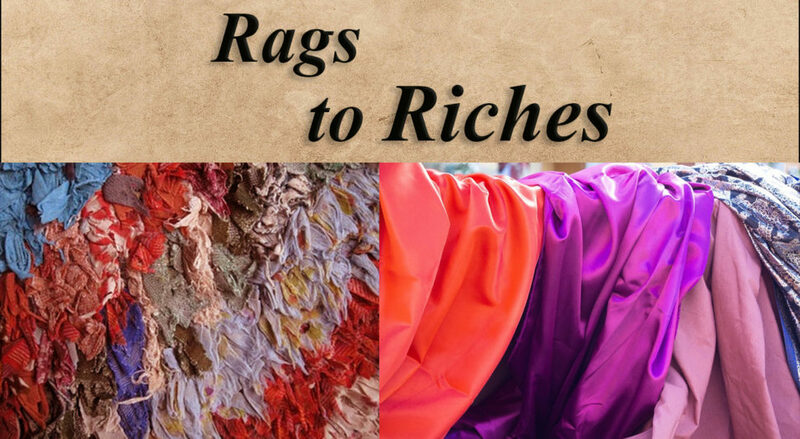 They also required the collection to be secure due to the high value of the materials. Identified capacity requirements (Collection) – determine the volume of the recyclable material you collect each day and how often the bin will be emptied. This ensures you purchase the right bin for the job. Decide on bin placement (Collection) – so they are easily accessible to those who are discarding the items. RVH required the bin to be in a central location for staff responsible for changing bed linens on the ward. For Richemont the bins had to be easily accessible to the employees who are responsible for manufacturing the jewellery. Decide on appropriate opening sizes and shapes (Collection) – Richemont required the openings to be very small to prevent people from reaching into the bin. For RVH it was essential for the openings to be large enough to accommodate bedding that had been gathered straight from the bed without causing a bottle-neck when deposited in the bin. Use clear graphics that tell people what goes in the bin (Communication) – for Richemont it was essential to prevent contamination in each stream. 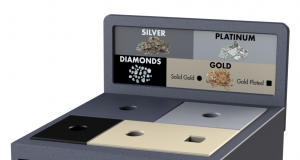 Gold had to be kept separate from platinum for example, to ensure that the precious metals can be recycled effectively. In addition to images of the recyclable items it’s recommended that the graphics are also color-coordinated with the restrictive opening to help people make the right choice. Communicate the program to the employees – it’s really important that everyone knows about the new recycling bins and how to use them. A new program launch is always recommended. Gather your employees together to present the new program and educate on how to use the bin effectively. Have senior management involved in the launch; this encourages employees to buy-in to the program. It doesn’t matter what you collect it’s how you implement the program that’s key. To learn more about how the CleanRiver 3C Process can impact your recycling program call us today at 1-888-646-4246 or email solutions@cleanriver.com.